PILATES AT ANY AGE – 30? OR 60? REFORMER DOESN’T DISCRIMINATE! 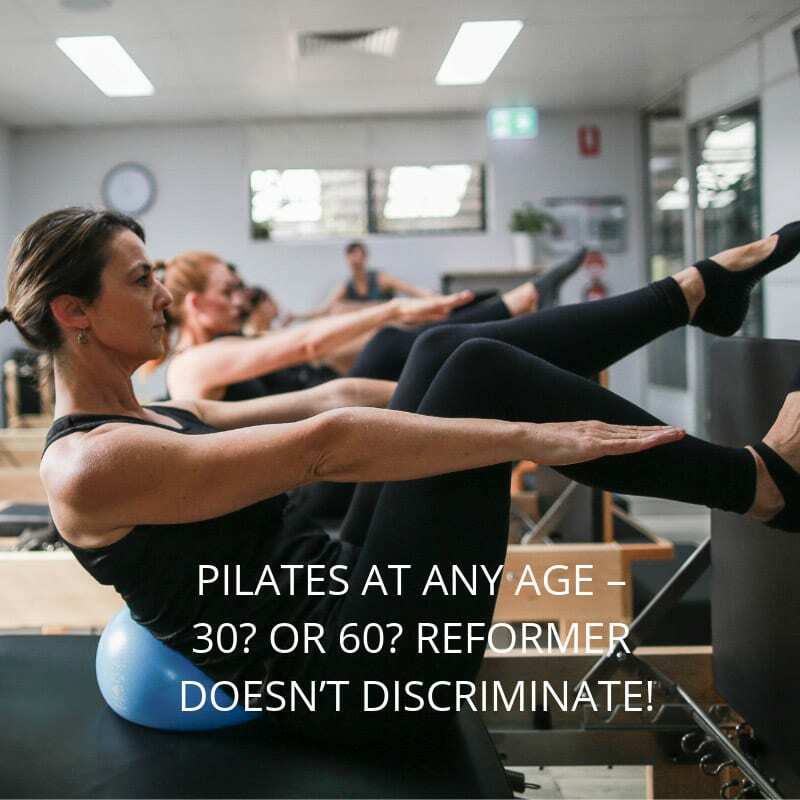 At Reform, one of the many reasons we love reformer pilates is that it is an exercise form that you can do and love at any age. Of course you may need to change your approach as you get older, but rest assured the practice of reformer is truly sustainable. In your 20’s – reformer is a great way to keep that fabulous, lean, young body strong throughout your 20’s. It’s no secret or surprise that most young Hollywood starlets admit to regular pilates workouts and when combined with cardio it’s a great weight-shredder. It also helps to get your core strong to help you through the child-bearing years. Laying the foundations as a young adult sets you up for life time of good health. In your 30’s – pilates is the perfect exercise for every woman is planning on having, or has ever had a child. The stress that pregnancy puts on a woman’s body is extraordinary. The perfect time to start pilates is well before you get pregnant, as pregnancy hormones make your muscles, tendons and joints extra stretchy. Starting pilates while pregnant can actually lead to injury if not carefully managed. In your 30’s you’re still young, naturally quite fit and bounce back from a workout or injury quickly. This is the perfect opportunity to work hard on building bone-density before the natural process of ageing really starts to hit you in your 40’s. In your 40’s – In your 40’s you will probably find that you spend an inordinate amount of time at a desk or doing physical feats you have no business doing (like deadlifting a 40kg child and 5 shopping bags without warming up. Sure… Why not?). Happily, I can report that when I went back to reformer at 40 after a 5 year break I was able to get up to speed and banish my pain within 10 weeks. In your 40’s you are still quite easily able to build strength, effect repair and feel the full benefits of a comprehensive reformer programme. If you haven’t started yet, now is definitely the time to sign up. In your 50’s – by your 50’s women generally start to experience symptoms of menopause including weight gain, hormonal fluctuations and bone density loss. It’s also a time where many women are still working full-time, caring for families and struggling to find the time to care properly for themselves. Regular exercise such as reformer pilates can help ease the menopausal transition and provide a regular space and time for women to really focus on their own health needs. By 50, many forms of high intensity exercise like cross-fit and running are beyond many people – even (or perhaps especially) those who have really worked their bodies hard in their youth. The signs of joint issue may start to creep in now, making reformer an ideal exercise form for this age group. Don’t get us wrong though – some of the technically most adept and inspirational pilates devotees we know are 50+. If you don’t believe us come into our studio and check out our model Lisa who features in our instructional videos. In your 60s and 70s – In your sixties and seventies, pilates provides a great way to continue to exercise, whilst ensuring the integrity of your joints. It promotes improved balance and proprioception which is essential for prevention of falls. It is also ideal for maintaining bone density, without the risks of other weight bearing exercises such as lifting weights at the gym. At this age, regular reformer pilates will keep you looking and feeling younger, and most important ensure that you are able to continue to do the most important things in life –playing with the grandchildren, enjoying your retirement by travelling and socialising and remaining independent in your living arrangements. So, no matter which age bracket you fall into now is the perfect time to start your reformer journey. Sign up for one of our free intro classes or contact us at team@reformstudios.com.au for more information. ← INTRODUCING OUR NEW STUDIO – THE CLUB!